Hey, hey! It’s my favourite thing to post when I can’t think of anything else: the retro scan! All posts can’t be of my videos now, can they? 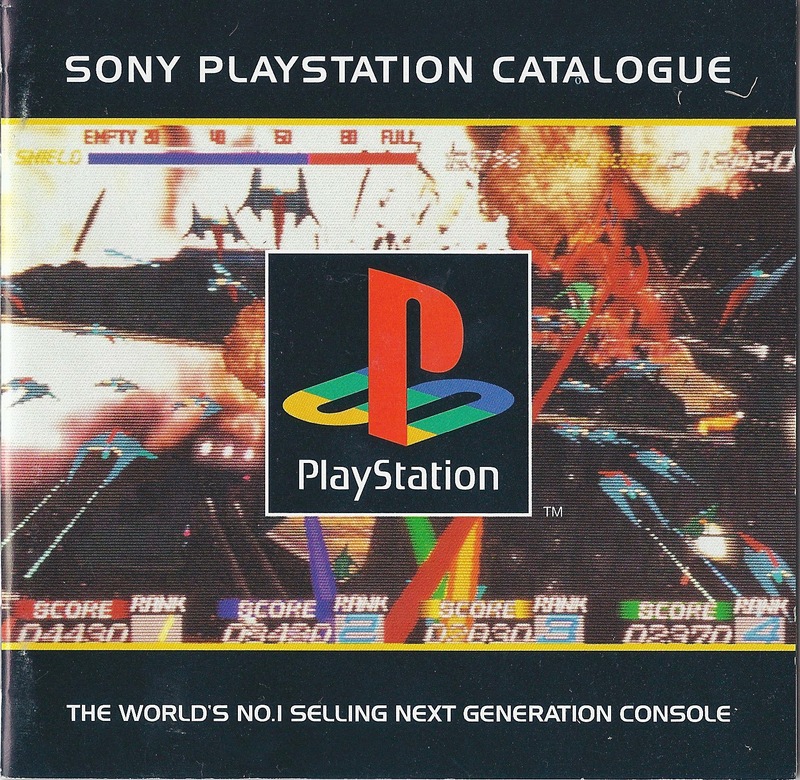 Today we're checking out the most ambitious thing I've posted so far; a catalogue for the original PlayStation. This will be the complete booklet too. There will be no part two nonsense here; Retro Game On is completely style over substance. Just check out that wood-grain background! I obtained this little gem of that plastic paper stuff while in Kalgoorlie on a recent trip. I mentioned it in that post, but I feel I should also add here that there was no demo disk with this booklet... but instead the PSone version of Duke Nukem 3D. Bet you're weren't expecting that now, were you? The catalogue starts off like all good catalogues should: chock-a-block full of explosions and bragging. I wish K-Mart would adopt this strategy. I wouldn't feel so cheap buying all my clothes there otherwise. 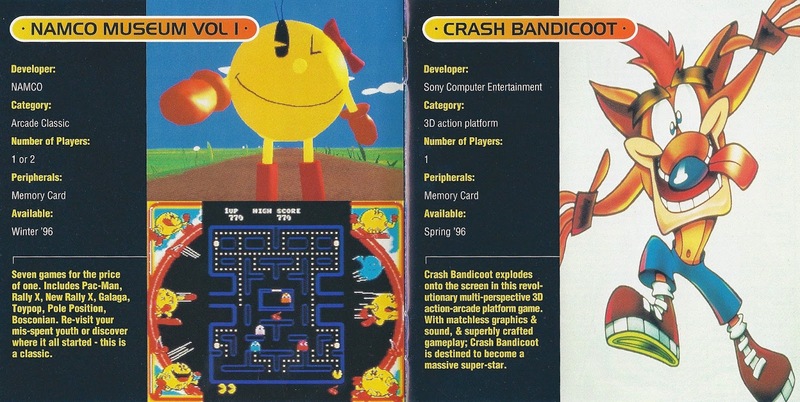 No doubt it was the best selling console at this booklets release though, which I guess was sometime during '95 or '96 going off the touted release dates for the games within. It's from here onwards you're greeted to information on two games per opened page, mostly sorted by genre. First off is one of Retro Game On's favourite genres: racing! Everything is sorted by developer, category, the number of players, supported peripherals and when/if its available. They also include a small blurb about the game written by someone obviously very enthusiastic. Remember kids, "F1 is way cool." Flip the page and it's all about the fighting genre; advertising two games I'm super keen to play but have never oddly come across in the wild since I assume (?) they sold well. Although I guess if gamers are going to keep anything it's going to be something they can still competitively play against their mates. People seem to get attached to these titles too; probably to do with dozens of committed hours learning all moves for a certain character. We've all been there. The fighting genre spills over into the next page with Tekken 2, mixed in with Resident Evil classified as a "3D Adventure". 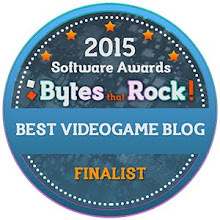 Personally, I would have classed it into the horror genre but I guess it is an adventure game too so what can ya do? I like how Tekken 2 running at 50fps is mentioned. A lot of games in the present will always show off their frame rate as a selling point, but it's easy to forget that it was exactly the same nearly 20 years ago. I love any PSone Crash game to death, so I think I'll stop talking about that now in favour of mentioning my interest in Namco Museum. I'm always on the look out for it as I'm sure it would result in a cool video. 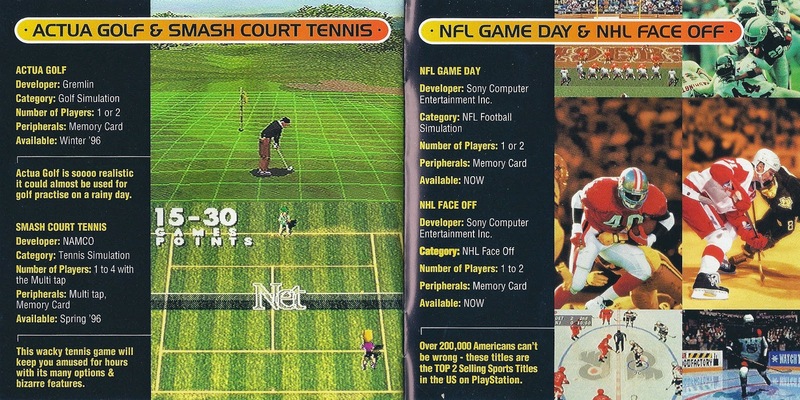 We're up to the midway mark for this catalogue now, where a table representing games already available is shown. It shows all the same information as the other pages, but adds the recommend retail price. Frankly, it's a relief to see that game prices in Australia were always bad, and not a recent drama. $89.95 for Krazy Ivan? Sure, why not. Onto another spread of mixed genres, Aquanauts Holiday is featured which is a game I've admittedly never heard of but I'm incredibly intrigued by. How many games let you be a fish? I don't mean a dolphin with powers either; an actual fish. Luckily for me and my Japanese PlayStation, it's quite a cheap import online so I may have to check it out one day. It can support a mouse interestingly enough, as well. Onto the next page and another '3D Adventure' is featured: Chronicles of the Sword. Why they didn't just lump this in with Resident Evil I have no idea, but who am I judge design choices from years ago? 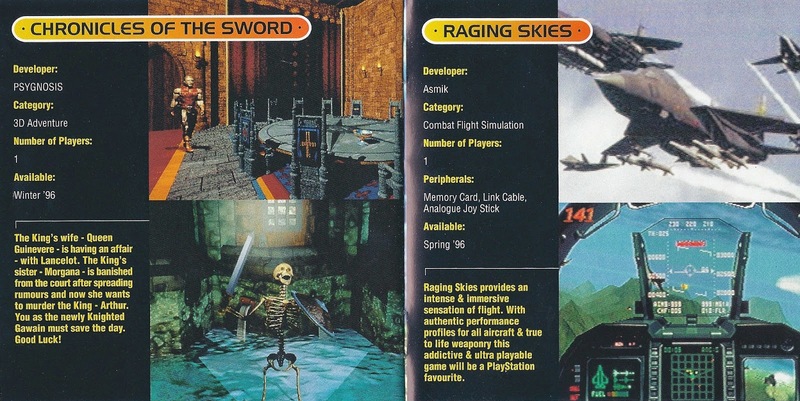 Also featured is Raging Skies, which sounds a lot more intense than it looks. We're all out of games but fear not, next up is a page not just full of peripherals, but power peripherals. 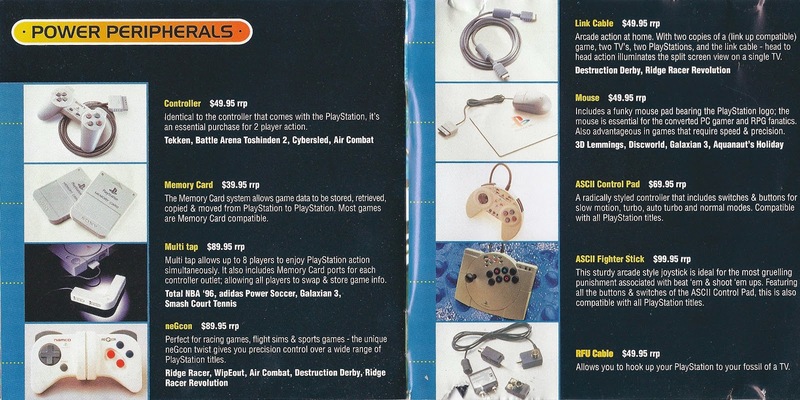 Cool things to note is that the dualshock controller is nowhere to be found because it didn't exist yet, along with a RFU cable so you can "hook up your PlayStation to your fossil of a TV." I find it funny that TV's without composite ports were considered old even in the mid 1990's. And that's it, nothing on the back of this booklet expect techoblabber that only Sony can understand. Did you know that the data engine has a clearing capacity of 80 MIPS!? Neither did I! I was going to call that PowerLine number for laughs, but I'm afraid I'll still get charged 80c/minute. 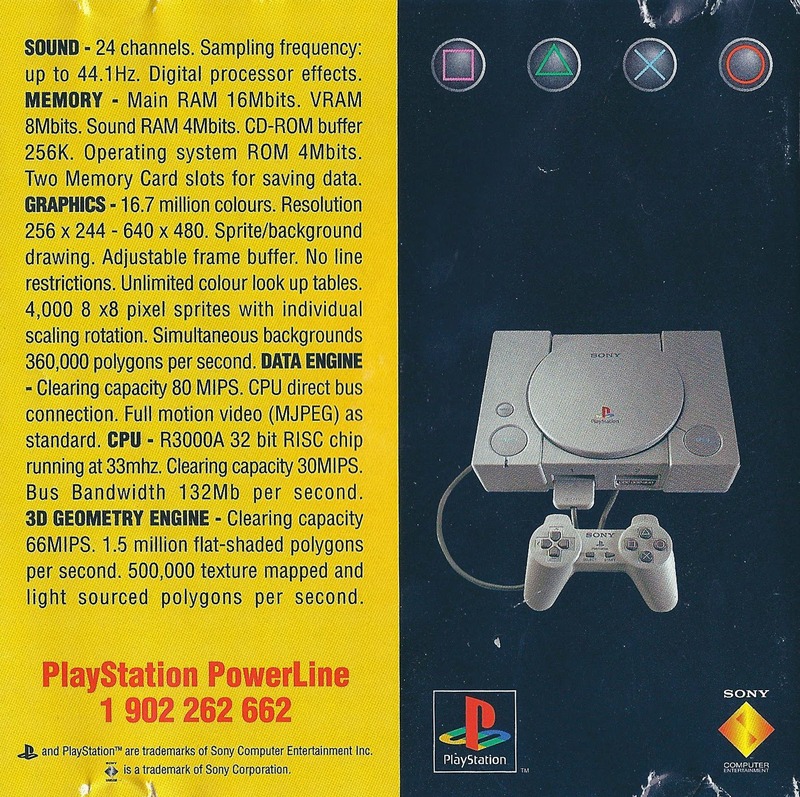 I was browsing through the internet looking for a catalogue that came with the NTSC PSOne but instead came across this nice little article, thanks a lot!